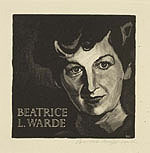 The typographer, writer, and historian of printing Beatrice Warde was educated at Barnard College, Columbia, where she developed an interest in calligraphy and letterforms. From 1921-1925 Warde was the assistant librarian at the American Type Founders Company, pursuing her research into typefaces and the history of printing. In 1925 she married the book and type designer Frederic Warde, Director of Printing at the Princeton University Press. The couple moved to Europe, where Beatrice worked on The Fleuron: A Journal of Typography, then edited by Stanley Morison. Her reputation was established by an article she published in the 1926 issue The Fleuron, written under the pseudonym "Paul Beaujon," which traced types mistakenly attributed to Garamond back to Jean Jannon of Sedan. In 1927 she became editor of The Monotype Recorder, in London. Beatrice Warde was a believer in the power of the printed word to defend freedom, and she designed and printed her famous manifesto, This Is A Printing Office, in 1932, using Eric Gill's Perpetua typeface. She rejected the avant-garde in typography, believing that classical forms provided a "clearly polished window" through which ideas could be communicated. The Crystal Goblet: Sixteen Essays on Typography (1955) is an anthology of her writings. 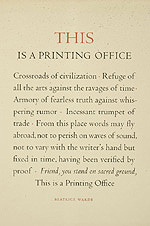 This Is a Printing Office, by Beatrice Warde, 1932. Broadside. "Set in Centaur and Arrighi types by Westcott & Thomson and reprinted for the Type Directors Club of New York on the occasion of their dinner honoring Mrs. Warde on April 28, 1950"
Portrait of Beatrice L. Warde, by Bernard Brussel-Smith. 1950. Wood engraving on Basingwerk Parchment. Signed with initials in block and in pencil on sheet, lower right. The Fleuron: A Journal of Typography, Cambridge, England: At the University Press; New York: Doubleday Doran, 1923-1930. No. VI, 1928, containing an article by Paul Beaujon (pseudonym of Beatrice Warde), "On Decorative Printing in America" Limited edition on hand-made Batchelor Kelmscott paper. Binding and end papers for no. 6 designed by Lucian Bernhard, Berlin. Beatrice/Paul/Warde/Beaujon: Quotations from the Writings of Beatrice Warde, Maple Shade, New Jersey: Printed by John Anderson, The Pickering Press, 1953. The Crystal Goblet: Sixteen Essays on Typography, by Beatrice Warde. London: Sylvan Press, 1955.